THE WOODLANDS, TX (May 5, 2016) – Colby Harwell has gone wire-to-wire and won his second Carlton Woods Invitational. Harwell, the 2013 winner, won with a final score of 2-under. The now two-time champion began the third round leading by one-stroke and thanks to a final day 2-under-par 70 he was able to end the day still ahead by one. Brady Exber and Edward Fryatt finished 1-under and tied for second place. In the final round at the Club at Carlton Woods Fazio Course Harwell got off to a blazing start with four front nine birdies as he opened in 4-under 32. Through the first seven holes on the back nine the Robinson, TX resident played steady golf with a bogey and a birdie. However, as he came down the stretch Harwell began to falter a bit with bogeys on the final two holes. 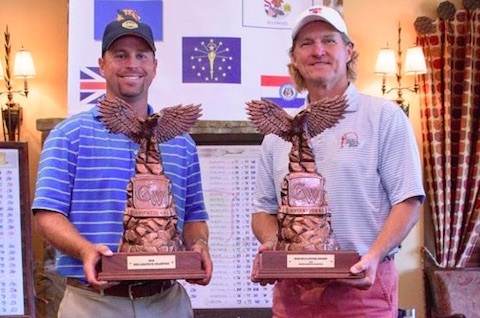 Despite the late bogeys Harwell had been able to do just enough earlier in the round and he was able to hold on and win his second Carlton Woods title. Brady Exber, of Las Vegas, NV, started the day 1-over and made a valiant effort as he tried to chase down Harwell. Exber put together the low round of the tournament firing a 3-under 69. Like Harwell, Exber shot an opening nine 32 with three birdies, a bogey and an eagle on the par-5 4th hole. Back-to-back bogeys on 14 and 15 proved to be to much for Exber to overcome as he completed likely his final Carton Woods as a mid-amateur. Another Las Vegas, NV resident in Edward Fryatt also finished a shot behind. Fryatt was impressive all day and finished his 2016 tournament with a bogey-free 2-under 70. Rounding out the top-five are Kyle Maxwell (The Woodsland, TX) in fourth at 2-over while Mark Mance (Whitefish, MT) and Christopher McKay (Dallas, TX) shared fifth with a 54-hole tally of 3-over. Harwell, Exber and Fryatt were the only players to finish the tournament under-par. When Harwell won the event in 2013 he finished 3-over. Defending champion Derek Meinhart (Matton, IL) was 19th and 10-over. In wire-to-wire fashion Lewis Stephenson has won his first Carlton Woods Senior Invitational. Stephenson finished with a 54-hole 4-under tally at the Club at Carlton Woods Fazio Course. Stephenson put together rounds of 69-70-73 on his way to a three shot victory over Mike Peck (Irving, TX), Michael Mercier (Rochester, NY) and Carlton Woods club member Mike Booker (The Woodlands, TX). All three golfers ended tied for second and 1-under. On Thursday with a two-stroke advantage to his name, Stephenson (Mansfield, TX) came storming out of the gates and quickly put the field in chase mode. After beginning the day at 5-under Stephenson birdied No’s. 4, 6 and 9 to reach 8-under. He would remain at that number until his stumbles coming in. On No. 15 Stephenson bogeyed and then he carded another on 17 before closing with a double-bogey on 18. Over the final four holes Stephenson was 4-over but he had played so spectacularly during the first 14 holes that he was still able to hold on. To nobodies surprise Mike Booker made the best run at Stephenson on Thursday. The three-time winner, playing alongside Stephenson, got as low as 6-under after a birdie on No. 14 before the wheels fell off. The downward spiral for Booker began with bogeys on 16 and 17 and concluded with a triple-bogey on No. 18. The triple on the closing hole dropped Booker from 4-under and in a potential playoff to 1-under and tied for second. In the Senior Division the 18th hole proved to be the second hardest hole on the final day. The 427 yard par-4 played to a scoring average of 4.675. On the day the hole yielded only four birdies while it issued 15 bogeys, five double-bogeys and two others. Herb Fisher (The Woodlands, TX) completed the top-five finishing in fifth at even-par. Defending champion Lee Sandlin (Dallas, TX) was tied for 10th at 9-over.